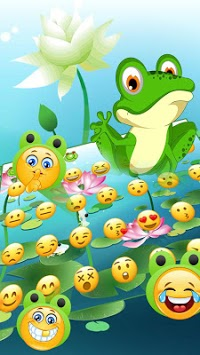 🎀 Cute Frog Big Eyes keyboard Theme is just around the corner, we will make your smartphone bring a cool background with this creative Cute Frog Big Eyes keyboard Theme designed by our creative team just for you! 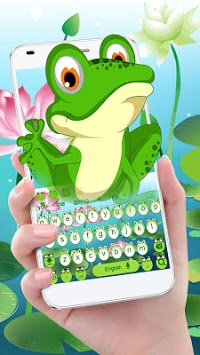 Get this Cute Frog Big Eyes keyboard Theme for your girlish keyboard free! It is so romantic paris theme.Cute Frog Big Eyes keyboard Theme. This 👌 beautiful keyboard is designed for people who 😍 Giltter element . Auto Complete and Word Prediction: Auto-complete the words you are typing and offer you accurate next-word prediction. ✔️ Auto Correction Corrects your types with various language correction models. ✔️ Emoji Maker Share the fun! Design your own emoji from hundreds of options, and then send your creation to your friends. ✔️ Emoji Prediction Recommend your favorite emojis as remembers not only words but also emojis. ✔️ Text Bang Offers a revolutionary way to edit long sentences by allowing you to easily copy or delete any words you choose. ✔️ Expanding Theme Choices Hundreds of fancy keyboard themes to make your keyboard style and new themes are delivered weekly! ✔️ The Most Compact File Size Takes up less space. Do more with your phone. How to apply the Cute Frog Big Eyes keyboard Theme? 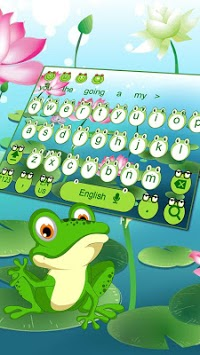 The Cute Frog Big Eyes keyboard Theme is a theme app. It needs you to download the keyboard engine first. Tap the INSTALL button and download it for FREE! If you already have the keyboard engine app installed, just tap the APPLY button and the Cute Frog Big Eyes keyboard Theme will be applied on your phone automatically. Cute Frog Big Eyes keyboard Theme currently supports over 100 languages! English (US, UK, AU), Spanish (ES, LA, US), Portuguese (PT, BR), Russian, German, Indonesian, Thai, Turkish, French, Persian, Arabic, Italian, Hindi ETC. Cute Frog Big Eyes keyboard Theme with most Android phones, including but not limited to: Samsung Galaxy Note7, Note 6, Note 5, Samsung Galaxy S7 and S7 Edge, Samsung Galaxy S6 and S6 Edge, Samsung Galaxy S5, Samsung Galaxy J7; Sony Xperia Z5, Sony Xperia Z4; Huawei P9, Huawei P8, Huawei Mate 9, Huawei Mate 8, Huawei Honor 8; HTC 10, HTC One A9, HTC Desire 10 Pro.